Coming home and relaxing in the perfect upholstered lounge chair for your home makes for a great ending to a busy working day. To ensure that you choose a chair that is not only comfortable but fits in with the rest of your décor, as well as keeps its looks for years to come, does need some thought and attention. Following a few simple hints on what to look for, as well as asking some relevant questions, means you can look forward to ordering the chair that is best suited to your needs. Are you looking for a chair for an older person in the household, where getting up and out of the chair may be a problem? Are you looking for a chair that can move back or have a raised footwell at the touch of a button? Is this a chair that will have to stand up to the rough and tumble of growing children? Does it need to be easy to clean in a tough stain resistant fabric? Once you start to think about who in the family unit will be using the chair and where in the home it will be placed, you get the idea of the sort of seating that is going to be best suited to your needs. Depending on the furniture already in the room, there will also be features such as the shape of the windows, doors and tables that will give a clue to the flow of the room. Circular shapes lend themselves to chairs with rounded arms, rather than the more solid block type of seating. If the space is restricted, then choose a chair with open arms to allow light through or wooden legs that lift the chair up from the floor, as these lighter options work well in smaller darker areas. If you are going for symmetry, choose matching chairs to be displayed as statement pieces next to each other, in between two sofas. Smaller lounge chairs in contrasting or complementary colours to a sofa, will present either a dramatic or a relaxing aspect. This depends on a number of factors, such as the existing furniture and accessories already in the home, and the overall theme you are aiming to create. Older properties lend themselves well to the “Chesterfield” look with deep seating, rounded arms in either leather or a fabric finish. Avoid geometric modern patterns or vibrant colours, if going for a restful traditional theme. On the other hand, bold shapes and brighter colours will bring a room to life, particularly if using contrasting tones. If the room is minimalist, clean shapes and styles with pale or white upholstery, will make the room seem larger and uncluttered. Cushions and accessories can be coordinated with floor rugs or blinds to keep the overall fresh and clean look to the room. Take stock of the view from the room and look at the colours and tones around you to decide on which shades will work best in the room. If going for a cosy feel, then soft warm leather in golden or brown shades will work well and for a “shabby chic” look, it will continue to perform well over the years of use. Retro and vintage rooms lend themselves well to a funky geometric pattern with a 1940’s feel to them, or a mix and match approach, so there is plenty of choice available. If this is going to be the chair where you relax and chill out at the end of the day, then think about investing in a recliner sofa. Particularly if you have a few aches and pains and need to adjust your seating position, having a chair that can do this at the touch of a button, will be the perfect one for you. If you do have some mobility issues, having a footrest that can automatically be raised and lowered will be a big benefit. There are also chairs that lift and support the disabled in getting up and down, which is also something to consider. Fortunately, robust and comfortable chairs are also very stylish, so you can go for a sleek chrome and leather finish that enhances the room. Very easy to clean and maintain, recliners are beautifully designed so they can be a statement piece and blend in with the décor. 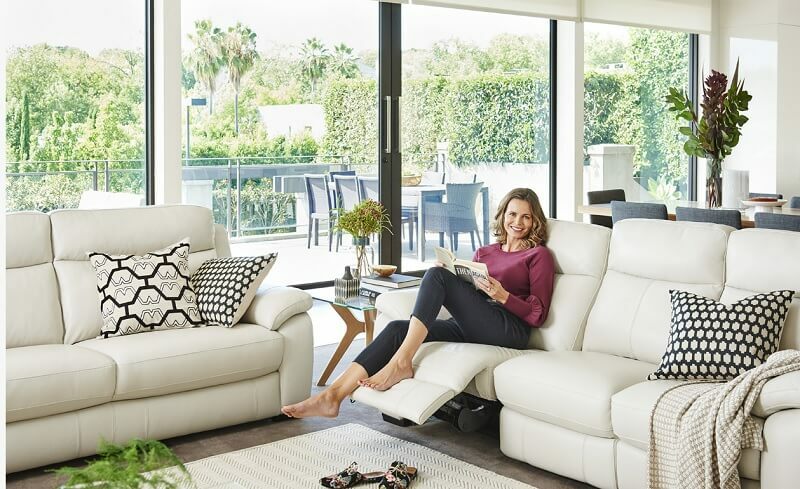 Once you have decided on which type of lounge chair fits your requirements, find out where your nearest showroom is and head down to try the chair out for size. That way, you can peacefully sit back and relax, knowing you have chosen the perfect upholstered chair for your home.